PERSI provides a simple way to access articles, photos, and other material you might not find using traditional search methods. This can help to build the historical context around your personal research, and the world your ancestors lived in. PERSI is crucial in identifying research, records and transcriptions that might not be found in any other print or online source. It also is key to locating “orphan” data – information relating to locations distinct from the periodicals they appear in. Never underestimate the value of genealogical and historical content from periodicals as a research tool. The fantastic resources available on PERSI contain over a third of the data available for discovering specific research, building contexts, and providing leads for further investigation. Our massive collection of more than 5 thousand U.S. and Canadian newspapers and periodicals will allow you to watch history unfold in front of you. Our intuitive search will help you search the millions of pages by keywords, date and ancestors' names. 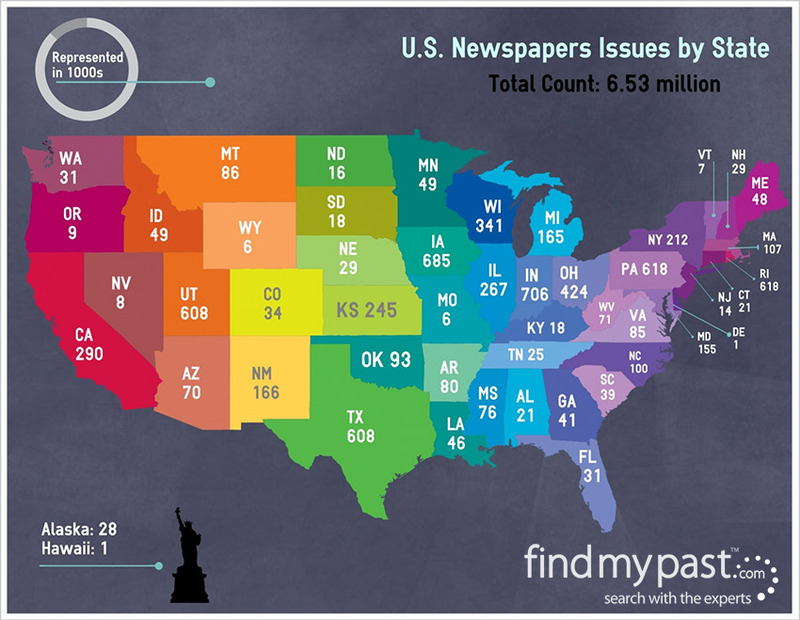 The map below shows findmypast's collection of US local and regional newspaper archives by issues per state. The total US newspaper collection tops 6.53 million issues of national history covering all 50 states.